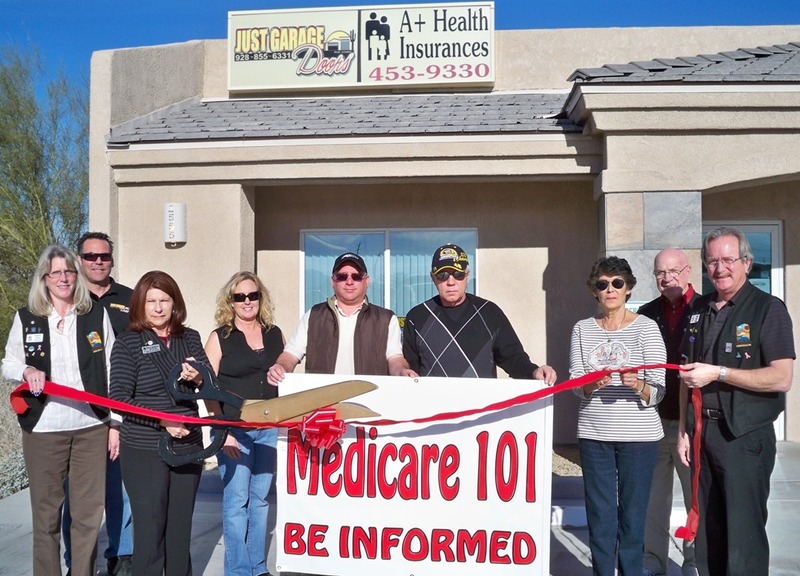 The Lake Havasu Area Chamber of Commerce Ambassadors celebrate A+ Health Insurances 15th year membership anniversary as a Chamber member and their 30 years in the Insurance industry. They offer individual and group health, Medicare Supplements, Medicare Advantage Plans, Senior Prescription Drug Plans, Life, Dental, Disability and Travel insurance. As an Authorized Broker with Blue Cross, Blue Shield of Arizona, they also offer many companies comparison shopping abilities. They would like to extend their appreciation to their acquaintances, friends, family, business colleagues and volunteers through the Chamber of Commerce. Pictured in the photograph from left to right are as follows; Chamber Ambassador, Audrey Hoyt, Jerry Grosman, Mona Robinson, Evonne Easley, Paul Robinson, Terry Robinson, Eleanor Johnson, Chamber Ambassadors Bob Keller and Steve Bentley. Stop by for a no-obligation quote at 2555 North Kiowa Boulevard, Suite #102 or call (928) 453-9330.